Lifelong Financial Freedom in Singapore: Why I invest in Cambridge industrial trust? In my opinion, Cambridge Industrial Trust is a wonderful company. So far it has been giving good dividends ranging between 0.01 to 0.02 cents every quarter. 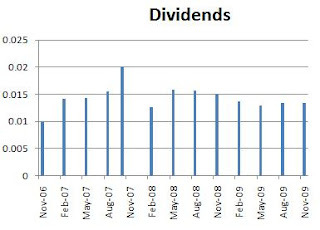 Even during the recession period at year 2008, the dividends given are still very good. At the current price of about $0.40, its yield is about 10% per year. From the company website, CIT invests in industrial properties such as logistics, storage and warehousing, manufacturing and showroom facilities all located across Singapore’s key industrial zones. With this strong fundamental and high occupancy rate, I believe that this company will continue to do well. Click here to see my other choice of stocks/ETFs. Seems to me that Cambridge do hav a huge debt, and the gearing of 42.5%. What's your opinion in this case? I am not really worry about the gearing factor. By the way, the occupancy rate is close to 100%. I can't seem to find any follow up on your Cambridge stock. Did you sell them all already?